OTSL is also unique in its glorious setting. Our tiny (987 seat) theater is nestled at the foot of a hill on a leafy suburban college campus. 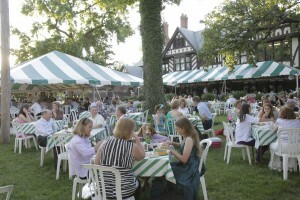 The hill is topped by a green-and-white striped tent surrounded by picnic tables, also decked out in green-and-white and topped with ivy and candles. Patrons picnic before the opera and then gather with the cast and crew afterward for conversation, drinks and nibbles. Operas are long and the show isn’t over until 11:00. “Afterward” can run well into the wee, small hours of the morning. The setting puts a demand on my recipe repertoire. Tasty, portable meals that can be served cold (and are light enough not to put you to sleep when sitting for three hours in a darkened auditorium) are at a premium. Poached salmon and drunken fruit have become staples. Fill a large skillet with water sufficient to cover the salmon. Add bay leaves, peppercorns, 2-3 lemon slices and wine. Bring poaching liquid to a boil. Simmer for 10 inches per inch of thickness of the fish. Melt butter and add herbs and remaining lemon juice. When salmon is ready, remove to server and drizzle with herb butter. Excellent with steamed new potatoes, asparagus or sugar snap peas and Drunken Fruit. Drunken Fruit is the perfect light summer dessert. Start with a selection of your favorite ripe fruits. I use whatever is at the farmer’s market, selecting a pleasing mix of colors. When peaches and plums are in season, I mix them with the last of the strawberries for a rosy treat. Earlier in the season raspberries, blueberries and Kiwi create a cooler palate. Wash and slice your fruit as appropriate. Sprinkle lightly with sugar as needed depending on how ripe your fruit is. Add a generous dollop of fruit liqueur: Grand Marnier, Triple Sec, Kirsch and Chambord are excellent choices. Toss fruit with sugar and liqueur and chill for at least a couple of hours. I find it easiest to use a plastic container with fitted top so that I can turn the fruit occasionally.